The sultanate or empire was a Muslim state which was formed on the Deccan plateau in India - one of the great medieval kingdoms of the sub-continent. Areas of the state had formerly been part of the territory of the Satvahanas at the beginning of the first millennium AD, while the sultanate itself was concentrated mainly on the northern Deccan, as far as the River Krishna. Following a revolt against the Delhi sultanate which governed the region, the Bahamani sultanate was founded on 3 August 1347 by the Turkic governor, Zafar Khan (otherwise known as Hassan Gangu). Ascending the new throne as Alauddin Hassan Bahman Shah, he was possibly of Tajik-Persian descent. He took over on the very day the sultanate was founded when the originator of the revolt, Nazir uddin Ismail Shah, stepped down in his favour. The new territory included parts of modern Karnataka, Maharashtra, and Andhra Pradesh, although true authority of the Deccan was always contested with the Vijaynagar empire. The Bahamani (or Bahmani) sultans claimed descent from the mythical early Persian king, Kai Bahman, and maintained a keen interest in Persian affairs and culture. Aladdin Hassan Bahman Shah was a man of humble origins, just like his sultanate, which was mainly agricultural in terms of economic activity. One of his first acts of expansion was to conquer the remnants of the Kadamba kingdom of Goa, apparently in 1340, prior to the Bahamani rebellion. Once this rebellion had taken place, the Bahamani capital between then and 1425 was Gulbarga (which was soon renamed Ahsanabad). Delhi governor and instigator of the Bahamani rebellion. Nazir uddin Ismail Shah asks Zafar Khan to become sultan of the new empire, with the title 'Sikandar- uth- thani Ala-ud-din Hasan Bahman Shah al-wali'. He is crowned on 3 August, and his first act is to transfer his title, Zafar Khan, to his son and adopt the title Bahaman. First ruler of the Bahamani sultanate. By this point, Bukka Raya of the Vijaynagar empire has gained the upper hand over the Bahamanis for control of the Tungabhadra-Krishna doab. Ruh Parwar, sister of the murdered Mujahid Shah, takes revenge for her brother's death by arranging the death of Daud Shah and blinding Sanjar, his son. She places Muhammad II, brother of Daud, on the throne. Muhammad Shah's nineteen year reign heralds one of the most peaceful periods in the whole of Bahamani history. Son. Reigned Apr-Jun. Blinded and imprisoned in a coup. Step-brother. Blinded and exiled in a coup. Son of Ahmad Khan, who was the son of Bahman Shah. The reign of Deva Raya of the Vijaynagar empire to the south is marked by continual attacks by the Velamas of Telangana, the Reddis of Kondavidu, the Gajapatis of Orya, and the Bahamani sultan himself. The capital was moved to Muhammadabad (Bidar) in 1425, and the sultanate reached the peak of its power during the vizierate (1466-1481) of Mahmud Gawan. However, during this period the nobles in the sultanate became classified into two categories, Deccanis (oldcomers) and Afaquis (newcomers). There were frequent differences of opinion between the two groups, culminating in the execution of the vizier in 1482. Later sultans were too weak to hold the empire together, and it fractured into five independent sultanates by 1518, with the last sultans ruling a rump state. Unlike his father, Vijaynagar ruler Deva Raya II is a forceful and powerful ruler. 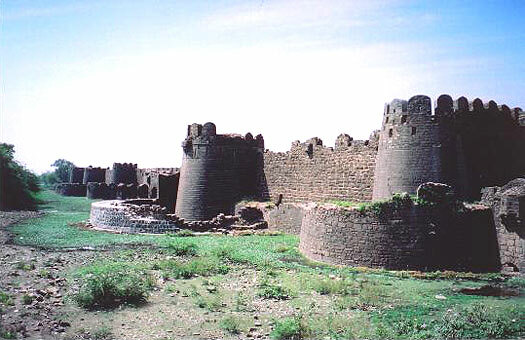 He succeeds in repelling invasions by Ahmad Shah while holding Mudgal fort. Ahmad Shah has taken over much of the Vijayanagar empire by this point. The Portuguese have also recently arrived in southern India, seizing many of the ports on the western coast that the Vijayanagar empire has until recently controlled. Son. Acceded aged 8 supported by a regency council. Brother. Acceded aged about 8. Virupaksha Raya seizes the Vijaynagar throne from his failed cousin, but still loses the Konkan coast (including Goa, Chaul, and Dabul) by 1470 to Mahmud Gawan, the Bahamani vizier (prime minister), when he is sent to conquer the area by Mohammed Shah. Vizier and driving force behind the sultanate's rapid expansion. Palace intrigues cause the downfall of the vizier. Mahmud Gawan, categorised as an Afaqui, has found it difficult to win the trust and confidence of the people of the Deccan. He is executed at the age of seventy by Muhammad Shah (a Deccan) for his policy of the rapid expansion of the sultanate which has made matters worse between the Deccanis and the Afaquis. Sarlashkar and then governor of Berar province. Governor/prime minister of Ahmednagar province. Murdered. Prime minister of Bidar province. Nizam-ul-Mulk Malik Hasan Bahri, the prime minister of the province of Ahmednagar, is murdered. His son, Malik Ahmed, the governor of the Bahamani province of Junnar (near Nasik), declares independence. Fath-Allah, the target of an assassination plot by the Bahamani sultan, also declares his independence. The Bahamani sultanate begins to disintegrate, eventually splitting into five independent sultanates at Ahmednagar (under Malik Ahmad), Berar (under Fath-Allah), Bidar (which remains closely aligned to the Bahamani sultan), Bijapur, and Golconda. Amir Barid, the son of the prime minister of Bidar, comes to power . He soon declares himself sultan and entirely removes the former province from Bahamani control. However, he also firmly controls the remaining Bahamani sultans themselves, virtually imprisoning them as he governs the territory. Quli Qutb-ul-Mulk conquers Golconda from the sultanate and becomes the governor of Telangana. With the disintegration of the Bahamani sultanate into five smaller sultanates all but complete, he declares independence and takes the title Qutub Shah, establishing the Qutub Shahi dynasty of Golconda. Son. Puppet of Amir Barid. Son. Puppet of Amir Barid. Dethroned. Son of Mahmud Shah. Puppet of Amir Barid. Poisoned. Brother. Puppet of Amir Barid. A new political force has appeared in northern India in the form of the Moghul warlord, Babur. He swiftly conquers the Delhi sultanate, and all the rulers of the Deccan (Ahmednagar, Berar, Bidar (whose ruler, Baridshahi, is soon defeated by Bijapur and his kingdom absorbed), Bijapur, and Golconda) send their congratulations. Kalim-Allah Shah also writes, begging for relief from Amir Barid. The news of this leaks out and Kalim-Allah Shah flees, first to Bijapur and then Ahmednagar, where he is murdered on the general agreement of the Deccan rulers, ending the Bahamani sultanate. After his death his son, Ilhamullah, proceeds to Mecca and never returns.